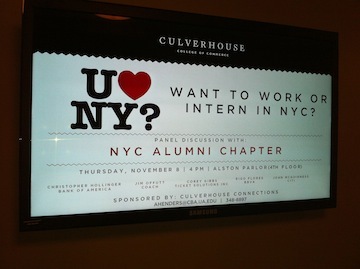 UANYC and Manderson Graduate School of Business joined forces once again. For the third-straight year, the Greater New York Chapter partnered with the Manderson Graduate School of Business to host a Student Career Development Panel on Thursday, November 8. Four Alabama alumni currently working in New York City -- UANYC President Christopher Hollinger (Bank of America), UANYC Treasurer Rigo Flores (BBVA), UANYC Vice President, New York Corey Gibbs (Ticket Solutions, Inc.), John McGuinness (Citigroup) and Jim Offutt (Coach) -- made the trip down to Tuscaloosa and met with more than 70 current Alabama students who are interested in moving to the Greater New York area upon graduation. The students also heard from three of their own as Kelsey Kurth, Rob Norwood and Caroline Shaw shared their fresh perspectives on internship experiences from this past summer. Kurth and Shaw spent their summer at Coach and J.D. Bell, Inc., respectively, while Norwood worked at Goldman Sachs.